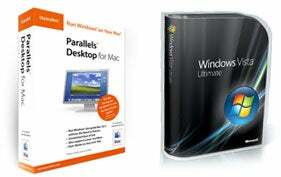 Just when we were starting to be impressed with the ability to run Microsoft Vista on the Mac, the plot thickens: If you want to legally run Vista on Parallels Desktop for the Mac, you're going to have to pony up for either the Enterprise or Ultimate Edition. Essentially, it's a money issue, where Microsoft's Home Editions of Vista costs $199 or $239, but the Enterprise and Ultimate Editions cost $299 and $399. But wait. If you have one of the Home editions of Vista, you can still run it on Parallels on the Mac, but you'll be doing that illegally, violating your End User License Agreement (EULA). Anyway, you can still legally run any Windows Vista edition in Boot Camp on Mac OS X, but that will require a reboot, and you can't use both Vista and OS X at the same time. This is getting pretty tangled up, making us wish for the good old days when there were only a dozen versions of Windows on the market.